One of the nation’s leading manufacturers of hospital beds and stretchers needed new innovations in their product families that added value and differentiation. Control Solutions LLC developed a hospital-grade motorized system to easily and safely move patients around the hospital facility. For the ambulance cot market, lifting patients on the cot from ground height to the ambulance has become an ever-increasing problem and worker’s compensation claims from the EMTs are on the rise. 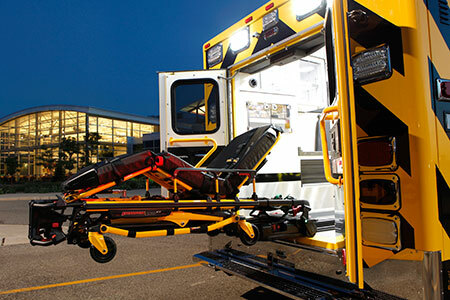 A leading medical products company chose Control Solutions LLC to design and develop a battery-operated power cot that safely lifts patients up to the heights of the ambulance bed. Recently, we also developed and manufactured a system that pulls the loaded cot and patient into the ambulance smoothly and automatically and then automatically recharges the cot lift system.